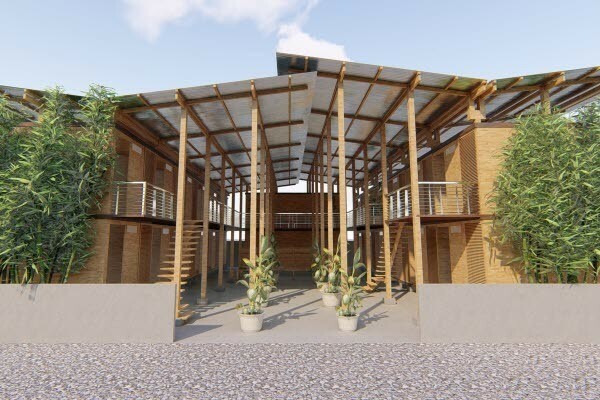 The creator of a low-cost house made of bamboo to tackle the chronic shortage of affordable housing in the Philippine capital has won a top international prize to design future cities in a rapidly urbanising world. Earl Forlales, 23, won the first prize from the Royal Institute of Chartered Surveyors (RICS) in its Cities for our Future competition. The prize money of 50,000 pounds ($63,915) will fund a prototype, as well as actual units. The house, known as CUBO, uses engineered bamboo, and can be put together in four hours at a cost of 60 pounds per square metre, according to a statement released Thursday. "The world's cities are growing all the time and there is a real need to make sure they are safe, clean and comfortable places to live in," said John Hughes, competition judge and president of RICS. "Earl's idea stood out for its simple, yet well thought through solution to the world's growing slum problem," he said. Of Manila's population of 12 million, about a third live in slums, possibly the most in any urban area in the world, charities estimate. CUBO will first be used to house the incoming worker population in the short term, and then extended to the city's slums. The plan also includes options to provide residents with new skills and jobs, Forlales said. "The affordable housing solution must necessarily be low-cost, sustainable, robust and long lasting. We cannot make do with band-aid solutions," he told the Thomson Reuters Foundation. "Housing opens up opportunities, so the solution must be decent and dignified, giving residents access to all necessary amenities for a better life," he said. The inaugural Cities for our Future competition - run by RICS and supported by the United Kingdom National Commission for UNESCO and the Association of Commonwealth Universities - drew more than 1,200 entries. Will food be grown in soil in 100 years time?